« Too We Tolerate Too Many Traffic Deaths? 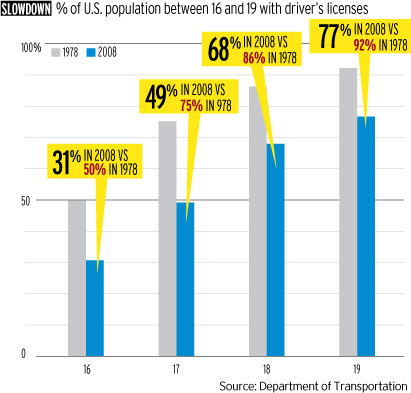 This Ad Age report cites a substantial decline in young drivers (and driving), and chalks it up largely to the “digital revolution.” Perhaps, but conspicuously underplayed is graduated drivers licensing programs, which have made driving (solo, at any time) at age 16 or 17 a thing of the past in many states (with good reason). This entry was posted on Tuesday, June 1st, 2010 at 12:47 pm	and is filed under Drivers, Traffic Culture, Uncategorized. You can follow any responses to this entry through the RSS 2.0 feed. Both comments and pings are currently closed.